Luton Carnival, said to be the largest one-day street party held in Britain, has been called off on the morning it was due to start. 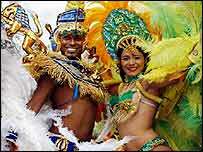 More than 150,000 people were expected at Monday's carnival, with about 2,000 residents taking part. Luton Borough Council said health and safety issues arising from the bad weather caused the cancellation. "We had to ensure the welfare of people taking part and those attending who would be at risk," a spokeswoman said. She added: "The continuing bad weather has caused New Bedford Road and the lake in Wardown Park to flood. Strong winds are also affecting our ability to erect stages and other structures. "The whole event is cancelled. Visitors must not travel to Luton for the carnival." Road closures will remain in place until further notice. The carnival reflects the different cultures of the residents of Luton and includes dancers in spectacular and colourful costumes. Is carnival an African tradition?